The Unknown is the fifth chapter in a series of exhibitions inspired by Alexandre Dumas’s classic adventure story; The Count of Monte Cristo. Working in a range of disciplines and media, the artists’ each plot their own responses to the novel’s settings and overarching themes of betrayal, disguise, revenge and patience, mapping out a narrative of imagined objects, characters, conversations and relics. For The Unknown, personal histories and Folkestone’s coastal location are combined as each artist examines a character that hovers between fact and fiction. The changing window display at the B&B over the 16th and 17th September will feature at various times Captain Cook’s voyage on The Beagle; promiscuous, myopic sailors; 19th century cross channel ferries, Napoleonic defences and sexually ambiguous aristocrats. Each character change will be accompanied by an announcement on a board outside the space. 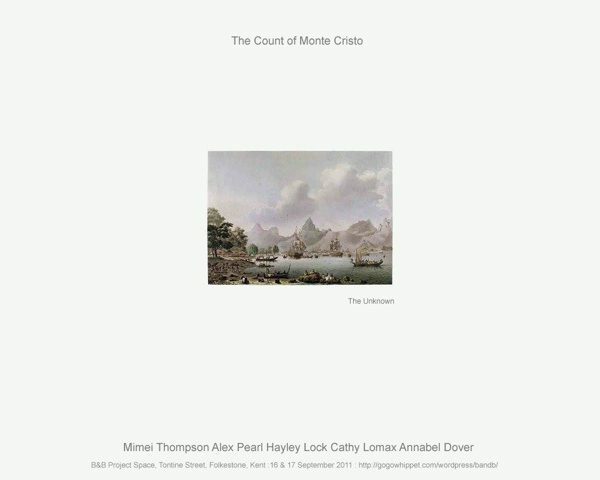 A special Count of Monte Cristo edition of the art fanzine Arty accompanies the exhibition and will be available to by from the B&B. Previous exhibition ‘chapters’ have taken place at The Phoenix Gallery in Exeter, Occupy Space in Limerick, Ireland and Rogue Project Space in Manchester. Set in the first half of the 19th Century, The Count of Monte Cristo follows the adventures of Edmund Dantes, a young sailor with a bright future – on the verge of being made captain of his ship and marrying the beautiful Mercedes. Falsely accused of plotting against the King by jealous rivals, he is sentenced to life imprisonment in the notorious dungeon island, Chateau d’If. While imprisoned in solitary confinement, an elderly prisoner tunnels into his cell while trying to escape. He tells Edmund of a fantastic treasure, of which he alone knows the location, hidden away in a cave on the tiny island of Monte Cristo. After many years in prison, and following the old man’s death, Edmund escapes and discovers the treasure. In various guises, he sets about using his new-found wealth to exact revenge on those who have wronged him and to reward those who have helped. The novel’s themes are of betrayal, patience and disguise; revenge, forgiveness and redemption and its sprawling plot is filled with twists and turns, lengthy deviations, historical and political references and characters with multiple identities. It has spawned a multitude of film and television adaptations, each focusing on particular elements of the narrative while editing out others.